a book review by Renee Hand: Behold, The Dinosaurs! Can you name 101 dinosaurs off the top of your head? How about the longest? 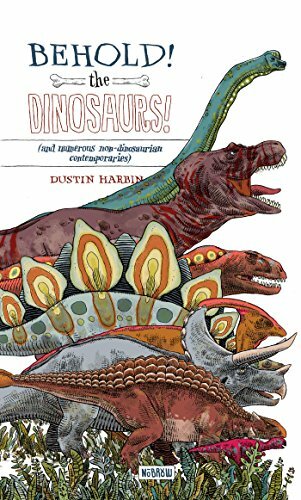 Dustin Harbin revisits some of the most awe-inspiring dinosaurs to roam the earth in the Leporello format, a simple but beautifully illustrated infographic book that unravels 6.5 feet long. Dinosaurs that lived in the Paleozoic to the Mesozoic eras are shown. The dinosaurs’ names, length, period, order or group lived in, and location around the globe is listed in boxes by the images. The illustrations also show some of the dinosaurs who were around first and how they evolved over time. Though this isn’t a story filled with text, it is a visual story that children who love dinosaurs are going to enjoy as they scour each illustration for dinosaurs they know, and learn about dinosaurs they don’t. The author didn’t cover every single dinosaur that existed in the Paleozoic and Mesozoic eras, but he did cover a healthy portion of well-known and unknown dinosaurs to delight the reader. The only quibble is the description boxes for each dinosaur. At times there were a little cluster of both dinosaurs and boxes and it was hard to tell which description belonged to which dinosaur; a line from the box to the dinosaur would have clarified that. Otherwise this infographic book is a real treat for children and adults who love to learn about dinosaurs.